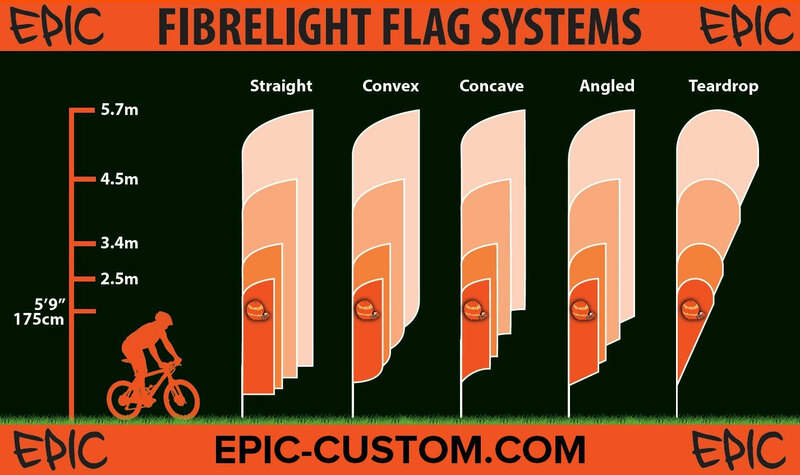 Here at EpicOrange we are proud to supply Premium Fibrelight Flags - for when image matters! Our Fibrelight Event Flags are available in many different sizes & shapes, with print & bases for all applications. You won't have to go far to spot one of our high quality branded event flags. Our Fibrelight flags are printed using high quality, machine washable, UV fade resistant inks onto quality polyester webbing. We also provide the option of both White & Black hemmed Pole pipe socks, to compliment any design and assist with ease of use. 1 x Premium 360 degree Ground Spike and 1 x Carry bag supplied as standard - without additional cost! Fibrelight flags are available in a choice of Teardrop or 4 x Feather shapes. all in 4 sizes including our new Epic-570 which stands a whopping 5.7 meters high! Our high quality polyester flags can be printed in high quality, full colour to one, or even two sides! Compact transport & storage bags are provided with every Fibrelight Flag purchase - at no additional cost! 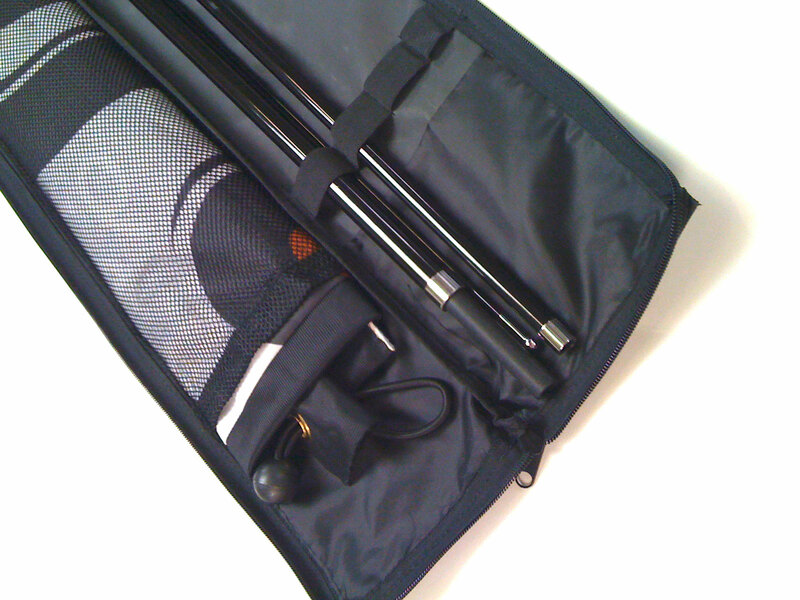 The strong, well constructed bags featuring pole loops for secure Fibrelight pole storage, an external pocket to safely contain the 360 degree Premium ground spike, an external card window for easy flag identification and two strong handles placed ideally for single hand carry or over the shoulder carry positions. 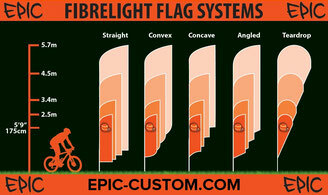 Premium grade, 360 degree ground spikes are provided with every Fibrelight Flag* - at no additional cost! Suitable for soft ground applications, like grass. Made from steel its strong rotating fixture allows the pole and flag to move with the wind and stops the feather flag wrapping around the flag pole. *Unless you specifically order a different base, in which case they are excluded from purchase. Heavy duty steel cross base, constructed from steel in two 2 inch wide rectangular sections. Removable Premium 360 degree spindle, folding legs for portability and easy storage finished in powder coated Black. This base is ideal for indoor use or occasional out door use with smaller feather flags or teardrop flags. 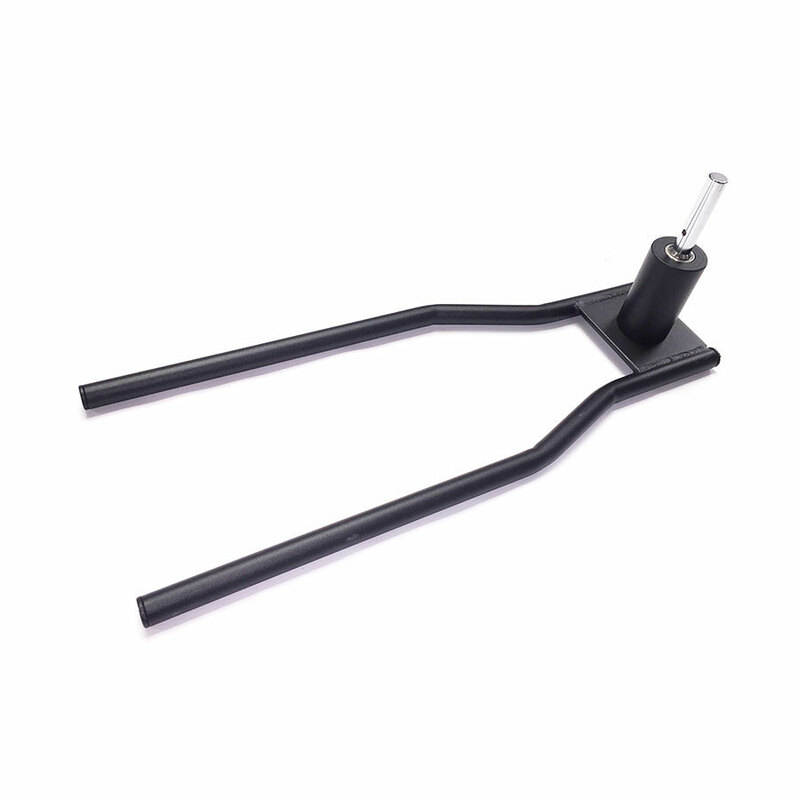 The cross base also comes with a Rubber waterbag weight for extra stability. The steel cross base weighs 5kg on its own and has a water bag weight giving an extra 10kg weight. High quality and durable plastic water fill base. 15kg filled weight provides a solid and secure mounting onto any hard pack surface. 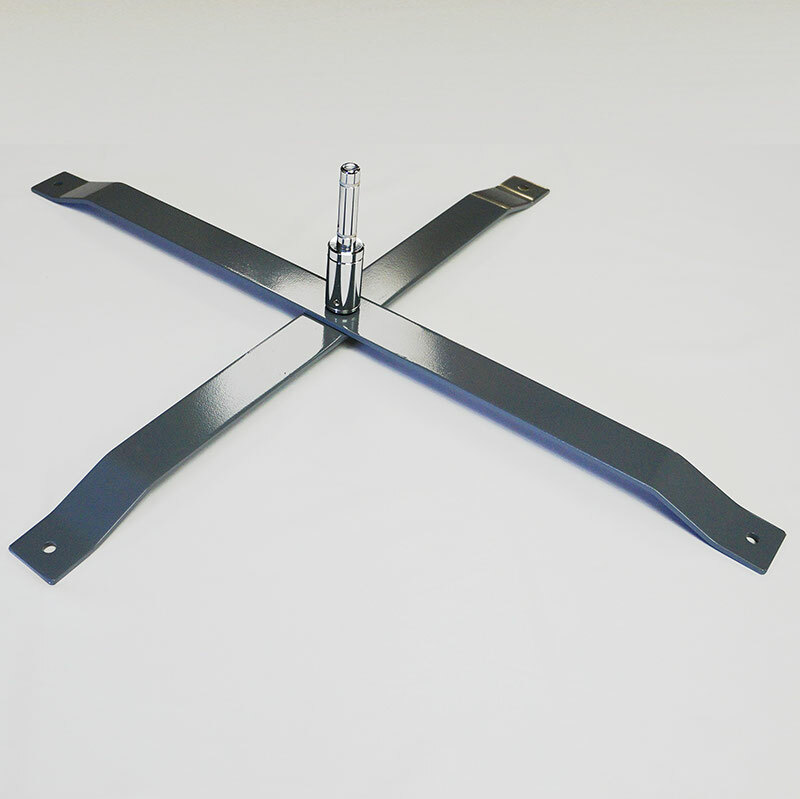 Our Premium mount fixture matches our Premium ground spike, with its 360 degree rotation, ensuring your flag moves with the wind. Features an integrated moulded handle. Convenient size for easy storage & transportation. Suitable for 2.5m & 3.4m flag options. 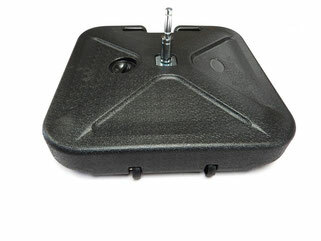 25kg filled weight provides a solid and secure mounting onto any hard pack surface. Our Premium mount fixture matches our Premium ground spike, with its 360 degree rotation, ensuring your flag moves with the wind. Integrated moulded handle and twin wheels make for easy manoeuvrability. Convenient size for easy storage & transportation. Suitable for all flag sizes. 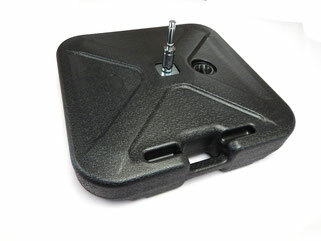 Popular throughout the car industry these bases can be used internally or externally. Manufactured from durable materials and built to last! Surprisingly low cost when purchased as part of a Fibrelight package! Suitable for all flag sizes. Heavy and Semi-Permanent feather flag and teardrop flag base. Ideal for positioning on forecourts where you will leave the feather flag or teardrop flag out almost all the time. 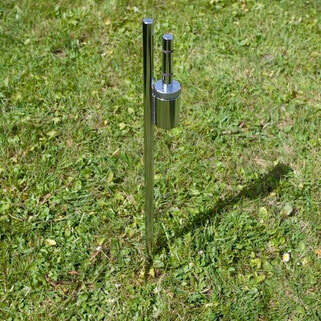 The weight of the flag pole base give you extra security and safety from more exposed areas of wind.